Security is our priority. We even have an app for that. Voice Link utilizes state-of-the-art technology with one of our newest call center services, YourVoiceLink Mobile App that sends secure messages to your smartphones and mobile devices. It has begun to replace and supplement paging technology, and enables two-way instant and secure communications. Keeping your data safe and eliminating outside access to personally-identifying information is more important than ever. Every business needs to maintain privacy for their clients’ and consumers’ personal data. For healthcare organizations, HIPAA and HITECH regulations are becoming stricter. The Department of Health and Human Services is expected to start auditing healthcare providers in an effort to find medical entities that fail to comply with HIPAA and HITECH regulations. By encrypting your information, and the additional layers of security, YourVoiceLink Mobile App helps ensure that your data remains confidentia, while being able to receive and respond to important and/or time-sensitive messages. You can even send secure a message to your colleagues from this app! Family Physician at Miller Family Medicine Clinic, P.C. Protect your patients and protect your organization when you use YourVoiceLink Mobile App to send encrypted messages to Android™, Apple® iPad®, iPhone®, iPod touch® and BlackBerry® mobile devices. Using YourVoiceLink Mobile App, we can easily generate customized reports for you so you can track and keep a record of all your messages. That means we can help you build your business and generate profits by presenting data to use in developing new business. Get in touch with us for more details. Keep Communications Private — Unlike SMS text messages, YourVoiceLink Mobile App encrypts messages to keep your Protected Health Information (PHI) secure. To ensure security, messages are not stored on your devices, passcodes can be required, and access can be remotely disabled. Save Time — Messages are immediately sent and received for fast, collaborative communications. YourVoiceLink Mobile App can save your staff two minutes per message when compared to legacy paging technology. Save Money — Let your clinicians and staff consolidate devices – reduce costs when you eliminate pagers! Use YourVoiceLink Mobile App to send an unlimited number of messages, with an unlimited number of characters in each message. Instantly Communicate — YourVoiceLink Mobile App immediately sends messages – eliminating delays. When composing messages, users instantly see which recipients have their status set to On, and which are Off. Critical messages can be designated as High Priority. Persistent Alerting helps ensure recipients see their messages quickly. Easy to Use — YourVoiceLink Mobile App gives you advanced communications with easy-to-use Apps for your smartphones and tablets. Users can easily customize Settings, such as Notification/Sound Options (including Silent, and numerous audio choices), as well as how often users are notified of pending messages. Easy to Access — YourVoiceLink Mobile App is available as either a cloud-based or on-site solution, allowing users to send messages from device to device, from the cloud, or directly from your call center. YourVoiceLink Mobile App uses both WiFi and 3G/4G technology to ensure messages are sent and received from virtually anywhere. Streamline Communications — Since messages are separate from other e-mail and SMS messages, YourVoiceLink Mobile App makes it easy to manage your messages. The message threads allow you to easily keep track of conversations. State of the Art Technology that you can trust! 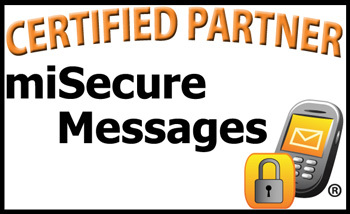 Voice Link is a certified partner with miSecureMessages. Interested in learning more about our secure messaging service and the YourVoiceLink app?